To do so, the researchers first worked with the material submersed in liquid. They added iron particles to a droplet of a gallium, indium and tin alloy immersed in hydrochloric acid. A gallium oxide layer formed on the droplet surface, which lowered the surface tension of the liquid metal. When the team applied two magnets in opposite directions, they could stretch the droplet to almost four times its resting length. 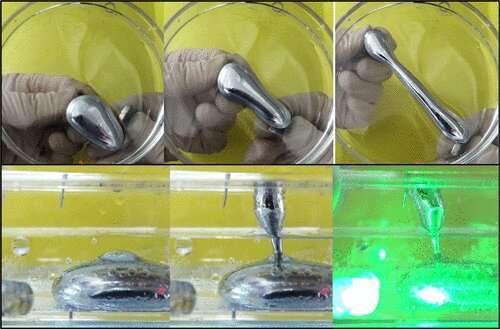 They could also manipulate the liquid metal to connect two immersed, horizontal electrodes and, by virtue of its conductive properties, light up an LED bulb. The liquid metal could even stretch vertically and then move horizontally to connect two electrodes—the upper one exposed to air, and the lower one in the hydrochloric acid. This demonstrated that the material didn't have to be fully immersed in liquid. In this way, the magnetic liquid metal was reminiscent of an upright walking amphibian, the researchers say.